After the death of Theodosius in 395 AD, the empire fell to his sons, the west to Honorius and the east to Arcadius. Arcadius left all the work to his adviser Ricimer, who seems to have been the one to make the fateful decision that he could not successfully defend the western part of the empire. Ricimer decided it would be better to let the West go, and concentrate on saving the East. The eastern empire was under attack from Huns from the north, and Sassanians from the east, and Ostrogoths from the north-west, and Ricimer thought that was enough. And in fact, once the Romans abandoned the western half of their empire, they did find it easier to defend the eastern half. 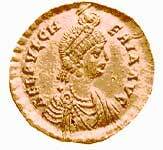 When Arcadius died in 408 (only 31 years old), his 7-year-old son Theodosius II succeeded him. Like Arcadius, he had an advisor who did most of his work. The advisor’s name was Anthemius. It was he who built the great walls of Constantinople, which stood for a thousand years without anyone forcing a way through them. But by 414 Anthemius lost his power to the emperor’s sister, Pulcheria, who kept that power in women’s hands for the next 36 years, her brother’s entire reign. Pulcheria was only fifteen years old when she took over! 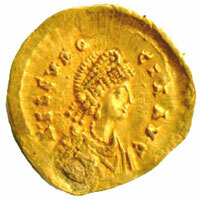 In 421, another woman took power in Constantinople: Theodosius’ wife, Eudocia. Eudocia had the laws of the empire codified in a large book, the Theodosian Code, which was the standard of law throughout Europe and the Mediterranean for the next hundred years. But when Eudocia got too powerful, Pulcheria got rid of her. Eudocia lived out her life in Jerusalem. Like Yazdegerd and his son Bahram in the Sassanian Empire, Pulcheria paid tribute money to Attila and the Huns, rather than attacking them. But when Bahram persecuted Christians in the 430s, Pulcheria sent a Roman army to attack him. Both sides used Arab mercenaries to do a lot of their fighting. Pulcheria succeeded in forcing Bahram to cut back his persecution of Christians living in his empire. But in 440, Bahram’s son Yazdegerd II started up the persecution again, and attacked the Roman Empire. 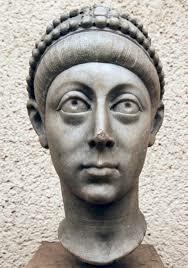 This time, Pulcheria was also fighting off a Vandal invasion, and she was worried about Attila and the Huns. So she just paid Yazdegerd to stop attacking for now. Theodosius II died in 450 (at the age of 49) by falling off his horse. He had no sons, but Pulcheria now married an ex-soldier named Marcian, and put him on the throne. Now they could stop paying tribute to the Huns. Marcian could lead the army to fight them. By 453, Attila was dead (no thanks to Marcian actually), and the danger ended, but Pulcheria died as well. When Marcian died in 457, Leo I came to the throne in the East. His most memorable action was a failed attack on the Vandals in Africa. How did the Vandals get to Africa? 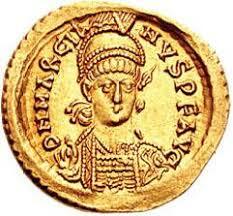 When Leo died in 474, with no sons, Leo’s 7 year old grandson Leo II became emperor. Leo II was the son of Ariadne, Leo I’s daughter. Ariadne immediately made her husband Zeno (Marcian’s son-in-law) co-emperor with her son. Leo II died very soon afterward, and then Zeno was emperor alone (with Ariadne). A coup in 475 resulted in Zeno having to leave Constantinople, but he returned in triumph two years later. One of his first acts was to accept the homage of Odoacer, who had just taken over Italy. Soon afterward, Zeno got rid of the Ostrogoths and got rid of Odoacer at the same time by sending the Ostrogoths, under their king Theodoric, to kill Odoacer and take over Italy in Zeno’s name, which they did. Imperial Purple, by Gillian Bradshaw (1988). A young adult novel about the court of Theodosius II. Cite this page: Carr, K.E. Arcadius to Justin – Byzantine History. Quatr.us Study Guides, August 2, 2017. Web. April 24, 2019.